This is not you basic/simple ordinary (boring) "piano" lesson. It's way beyond and way more fun! Professor David Musial is an Award-Winning • Music & Video Creator and Producer. New York University for his 4 yeras of Graduate studies! Music, Video & Film Production and Electrical Technologies. with a TON of PATIENCE, so say the parents! Music is the Universal Language and there is Psychological Power in Music! Slap your thighs twice and clap once.. what song is that? "We Will Rock You!"... Did I sing anything? Did I play any notes? Our mission is to teach your child to play the piano (or synthesizer and/or organ keyboards), through a very unique-award winning custom approach. You child is obviously surrounded by technology, and why not utilize the tools you already own, to encourage fun, creative and productive "practice" schedules? Some of our students are already playing keyboards in churches and performing on public stages at the age of only 7! Your child probably is introduced to more music through "video games" since they were toddlers, then you heard on the radio growing up. We incorporate these elements and teach them how to write simple lyrics about the games they play and then how to apply note values & melodies (scales) to these, and voilà, they are making songs while not realizing that the "boring" scales and "rhythm" drills have turned into valuable tools, which they will use in their musical life forever. Visit the "Testimonials" to see our outcomes! Many of the kids get involved in group music videos like: Newport Skates, The Fidget Spinner Dance, The Mermaid Dance, It’s My Castle and currently “What The Heck Is Dyngus Day?? ?” The group lessons start with the obvious basics… some scales & warm-ups. There also are some music appreciation listening sessions where he shows through Sound Synthesis on iPhones & iPads, what traditional instruments sound like. He also teaches the differences between the basic music classifications like Pop, Jazz, Rock, Country, Urban (the differences between Rap, RnB & HipHop), Dance/EDM, Ethnic, Classical, etc. They will sing some standard group songs and in each class, the kids help to write songs lyrics. Eventually we create a group song and we head to the vocal booth in SkyRoom Recording Studio perched high on top in a unique Penthouse Suite, in the first condo in Newport THE EMERALD (formally the James Monroe), and we all experience your child participate maybe in their first professional recording studio session! (Bring cameras parents! LOL) We film the vocal session in Ultra HD 4K video and then soon after, a music video is made for all to enjoy. (If any proceeds are earned from YouTube, they are donated to the MusicTech Kids Scholarship program on Patreon.) Maybe they enter the private lesson program in Keyboard, Guitar, Drums, Winds (Recorder, Flute Sax) or Trumpet? This is not your “ordinary” kids group music lesson! Prof. David Musial is a master at Music Technology winning “Instructor-Of-The-Year” at New York University & a high award at Best Colleges for the Music Technology program he created at Stevens Institute of Technology. He also inspired the “Student Division” for the “Bob Moog Foundation” THE Music Technology Legend! He is also a master in conducting Choirs. One song with a children’s chorus section “Spread Peace All Over The World”, was used by the United Nations for the 50th Anniversary. He has been a professional church musician since the age of 10! He was hired to play the king of instruments, the PIPE ORGAN and to accompany a choir of about 20 singers at a church in Buffalo. He has gone on to conduct a multitude of choirs, many where with children… especially at Christmas time with songs like “The Drummer Boy” & “O Christmas Tree”. Most of Professor Musial's college "kids" when asked the question "Where do your see your self after graduation?" answer; I wanna make MSUIC for VIDEO GAMES! When one student entered SkyRoom Student at age 6, he asked Professor Musial if he could play the song "Minecraft"? Musial knows many, many songs but never heard of this song. His mom interrupted the session and apologized and said that the boy was obsessed with this video game and thought he was in Video Game Paradise with all of the "Computer Screens" in SkyRoom! So David thought "Hmm, how on Earth am I going to get this excited, rambunctious child to ever learn to play boring scales, which are so vitally important? Presto, Musial instantly wrote a song with him titled "Zombie Dance" and used 3 scales and words inspired by the boy’s visual explanation of his dream to be inside a video game. This instantly captivated the boy’s attention. Musial proceeded to record the song with loops of sounds the boy selected (he thinks he making MUSIC for a VIDEO GAME). He then taught the boy to sing it into a top quality Mic and they make a pop-dance song! Musial then filmed and edited a music video starring the boy at just age 6! The bow now had already played the grand piano and the pipe organ and sang in POLISH in his church 4 times at just age 7. He can't wait to practice and asks every Sunday at church if he can play more! Now he has become a live stage performer, all because of the unique, Award-Winning "MusicTech Kids™" approach to teaching children the art of Music! Music Technology was introduced to David when he was just 7 years old and he has been a professional church musician since the age of 10! He was hired to play the king of instruments, the PIPE ORGAN and to accompany a choir of about 20 singers at a church in Buffalo. He has gone on to conduct a multitude of choirs, many for children… especially at Christmas time with songs like “The Drummer Boy” & “O Christmas Tree”. David has since worked on or produced over 1,000 songs with Music Technology tools, worked on over 400 TV show episodes including many cartoons, video game and film scores! He worked his way though the early days of college teaching children how to read music and play the piano and organ. He then won scholarships to the Juilliard School of Music where he studied the Psychology of Music and won Instructor-Of-The-Year 4 times at NYU. Professor Musial's Music Technology work on the "Anti Bullying" venture created by the United States Department of Education won an Emmy Award for MTV! A 12 year old boy was one of the singers. Many of his students get hired to act and sing in cartoons he also works on, how cool? Many eventually perform at D.A.R.E. Drug Awareness Graduations for 10 year old kids, we even performed at the International Convention! Prof. Musial has taught hundreds of children, and some have grown up to perform in Disney, in Sports Arenas, on Broadway and even in the “Hall of Heroes” in the Pentagon, imagine that? David uses Music Technology instruments live and via “tape” to make the sounds of realistic orchestras. This has worked so well that he was featured in the New York Times, Business Week and also Modern Liturgy magazines! His "Smart Trax" educational media company won a unique, prestigious award for "PROMOTING POSITIVE MESSAGES THROUGH MUSIC" to the youth of our nation by the United States Department of Justice.He went on to design the Bachelors Degree in Music Technology at Stevens Institute of Technology and his curriculum won second place in the nation as the “Most Innovative Changing The Industry”! He also inspired the “Student Division” for the “Bob Moog Foundation” THE Music Technology Legend! He is also a master in conducting Choirs. He has taught hundreds of children, and some have grown up to perform in Disney, in Sports Arenas, on Broadway and even in the “Hall of Heroes” in the Pentagon, imagine that? David uses Music Technology instruments live and via “tape” to make the sounds of realistic orchestras. This has worked so well that he was featured in the New York Times, Business Week and also Modern Liturgy magazines!One song with a children’s chorus section “Spread Peace All Over The World”, was used by the United Nations for the 50th Anniversary. He then won the Buffalo Music Hall of Fame Award! 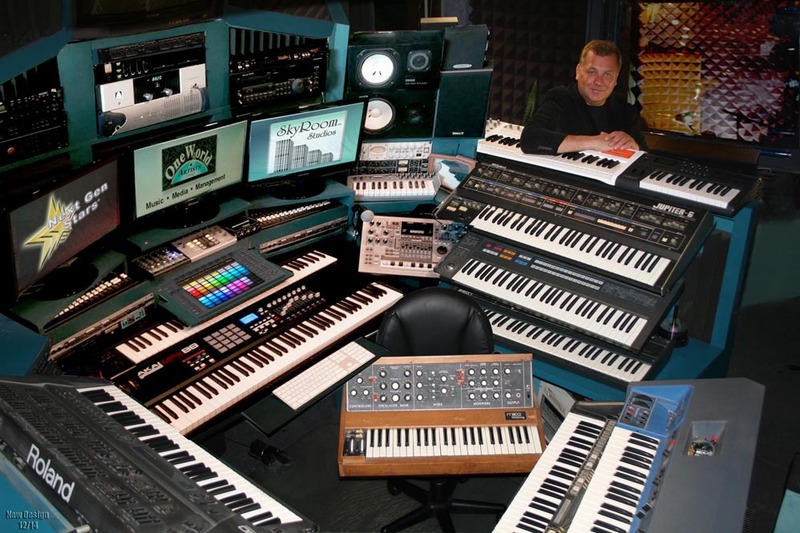 Now Prof. Musial is running his own school of Music Technology at the amazing SkyRoom Studio perched high in a Penthouse Suite in Newport/Jersey City, as a private consultant and this is the “Kids” division! Prof. Musial is in discussions with 2 major book publishers for his new Paper/eBook & cartoon series called “MusicTech Kids™”. More details here and course details soon. See what his students say!